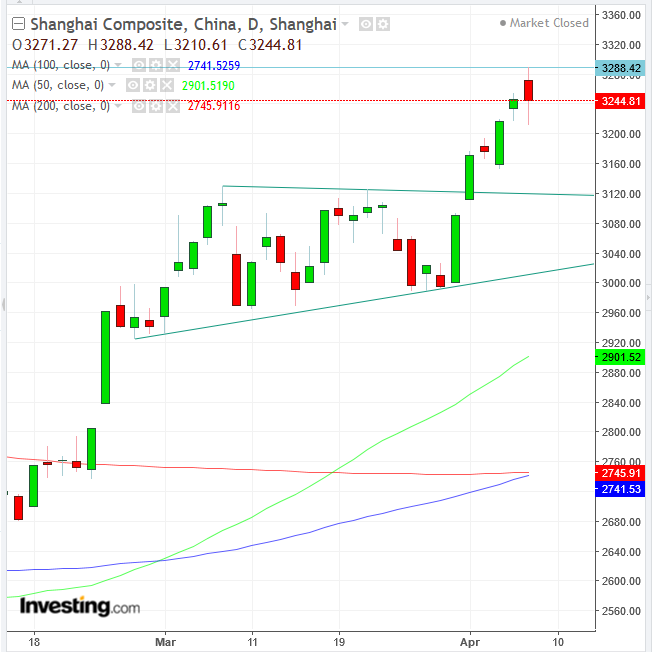 The global stock market opened the week in a defensive stance this morning, as the biggest trade dispute in decades continued to loom unresolved in the background and expectations of a rough earnings season ahead threatened to challenge even the most stubborn of bulls. The STOXX Europe 600 remained trapped within a congestion since Thursday and dropped, erasing Friday’s gains. Meanwhile, futures on the , and NASDAQ 100 all pointed to a weaker opening in the upcoming U.S. session. In the earlier Asian session, regional benchmarks posted a mixed picture, as climbers gave up gains and losers bounced off lows. While negotiators from both the U.S. and China signaled some positive progress last week, traders decided to focus on Q1 earnings headwinds and thereby adopted a defensive posture—amid expectations of a 3.9% year-on-year average drop across S&P 500-listed companies, which would mark the largest earnings plunge since Q1 2016. Japan’s (-0.21%) briefly reached levels not seen since Dec. 13, only to dwindle into negative territory. China’s (-0.05%) was flat at the end of a day that saw the highest levels since Mar. 22 last year but also some volatile session lows. Technically, the 100 DMA is attempting to cross the 200 DMA, after the 50 DMA had already done so, which triggered a golden cross in mid March amid the development of bullish, ascending triangle. With the index pausing for the first time in a five-straight-day rally, traders should brace for a likely return move after the pattern’s completion. Hong Kong’s (+0.47%) posted a more upbeat performance, hitting its highest level since June 15, as of the time of writing, resuming a rally after Friday’s setback, which came after eight day of gains out of nine. Technically, the 100 DMA is aiming to overcome the 200 DMA, after the 50 DMA, posted a golden cross early last month. South Korea’s (+0.04%) eked out a seventh day of a rally, after bouncing off the 100 DMA, cutting through the 50 and 100 DMA in the same day. The price, though, fluctuated and closed mid-range, well off both its highs and its lows. Finally, Australia’s (+0.65%) bucked the mixed trend and posted solid gains, erasing nearly all of Friday’s rout. Yields on 10-year Treasurys dropped for the fourth consecutive session, though they reverted higher in the late European morning. Traders, however, should be wary of a potential bullish flag, to the downward biased congestion. The dollar erased Friday’s gains, confirming the April-high resistance. 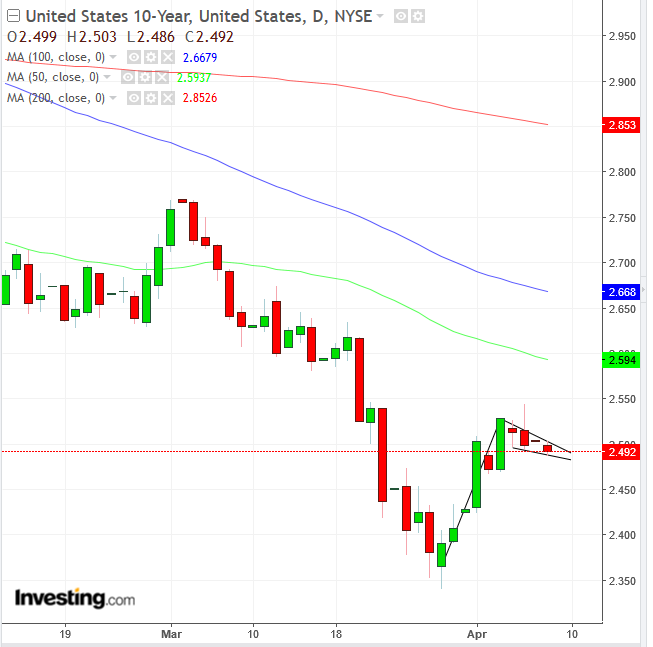 Overall, Treasurys and the greenback are holding relatively stable, considering that President Donald Trump ratcheted up pressure on the Fed to favor market growth ahead of his re-election bid. Friday’s jobs report, beating expectation, corroborated last month’s low inflation figures and motivated Trump to step up his calls for more policy accommodation, as well as to make two controversial picks for the Fed board. However, analysts’ warnings against the worst earnings results in three years lurking on the horizon—which could trigger a market tumble after last year’s stellar company returns propped up prices to record highs—risk offsetting the effect of upbeat economic readings. Meanwhile, the pound wiped out most of Friday’s losses—which were stopped atop the 200 DMA—as British Prime Minister Theresa May appealed to both the public and lawmakers to support a compromise Brexit plan. Oil extended a rally toward the halfway point to $64 after self-organized military forces led by commander Khalifa Haftar attacked Libya’s capital Tripoli, throwing the country into a state of chaos that threatens to oust international forces from the country and cause major oil supply disruptions. 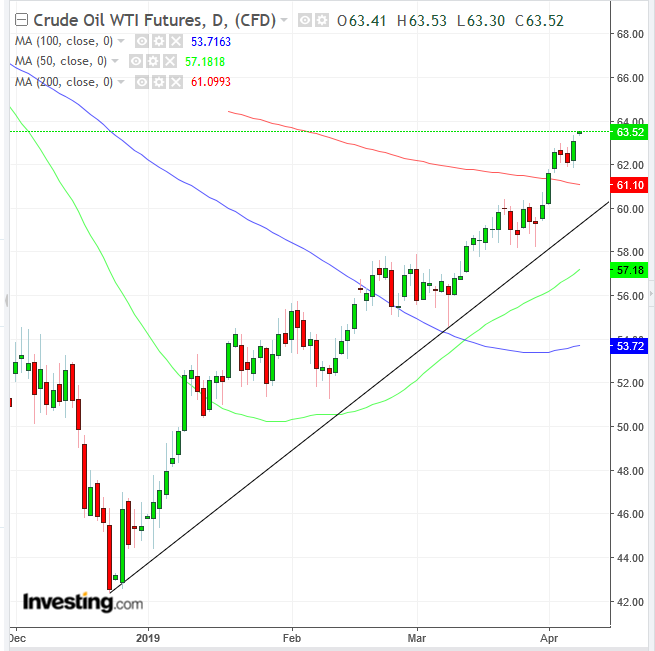 WTI price gains followed a gap above the 200 DMA—the highest level since Nov. 1, after the commodity sealed its best returns in nearly two months last week. Prospects of a confirmation, from OPEC’s monthly supply report, of ongoing production tightening are also helping the price higher. Canadian for March are released Monday. Canadian for February are released Monday. U.S. banks begin reporting first-quarter earnings, led by JPMorgan (NYSE:) (NYSE:JPM) and Wells Fargo (NYSE:) (NYSE:WFC). Israelis head to the polls on Tuesday for general elections that could see incumbent leader Benjamin Netanyahu become the longest-serving prime minister. The annual Spring Meetings of the World Bank Group and the International Monetary Fund begin in Washington on Tuesday. The ECB is expected to leave its key interest rates unchanged on Wednesday. Investors will be looking for further details on the TLTRO program. West Texas Intermediate crude climbed 0.4% to $63.34 a barrel, the highest in five months. Gold increased 0.4% to $1,297.26 an ounce, the highest in more than a week on the biggest climb in two weeks.